Download the document in full here. THE GOVERNMENT PUBLISHED legislation to allow for legal terminations in specific circumstances in Ireland this morning. The Protection of Life During Pregnancy Bill 2013 was approved following a Cabinet meeting yesterday and published after midnight. The Department of Health says the legislation is “fully reflective” of the heads outlined in April but with “certain refinements and extra safeguards”. It does not create new rights but remains within the parameters of the Constitution and the Supreme Court judgement in the X Case. The changes, which were informed by the three-day hearings by the Oireachtas Health Committee, include the introduction of the Minister’s powers to suspend a service if he believes an institution is not complying with the provisions of the Act. The proposed laws will now be debated in the Dáil and Oireachtas with a view to enacting them before the summer recess. 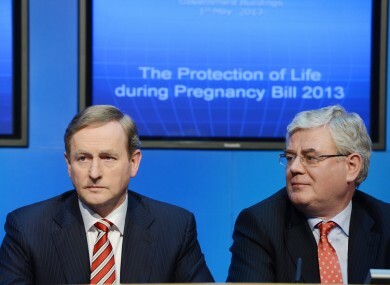 According to the coalition, the Bill “restates the general prohibition on abortion in Ireland”. “It’s only aim is to place a legal framework on an already existing narrow provision – set down by the Supreme Court in 1992. Based on the tight parameters in which it is set, the Protection of Life during Pregnancy Bill 2013 outlines the circumstances in which a rare but life-saving termination may be permitted. Health Minister James Reilly described the legislation as a “balanced set of proposals aimed at meeting the judgement of the European Court of Human Rights”. “I believe that pregnant women and their doctors will now benefit from the far greater legal clarity this Bill will bring,” he continued. The controversial inclusion of suicide ideation as a grounds for a termination is outlined in the Bill. In a case where there is a risk to a woman’s life because of suicide, the assessment process must include three specialists, including two psychiatrists and one obstetrician/gynaecologist. Where feasible, the woman’s GP will also be consulted. The Bill lists 19 public hospitals with obstetric units as “appropriate institutions” where a termination can be carried out. Other large hospitals and teaching hospitals are also permitted to carry out medical procedures if a woman with physical ill health requires intervention. The legislation will see information about terminations recorded and handed to the Minister for Health. Such details will be anonymised and compiled into an annual report. Email “Abortion legislation approved and published ”. Feedback on “Abortion legislation approved and published ”.